D.L.Thurrott Air has a team of highly skilled, factory trained service technicians whose primary focus is always Customer Satisfaction. We have gained a well deserved reputation for providing the highest quality services available. 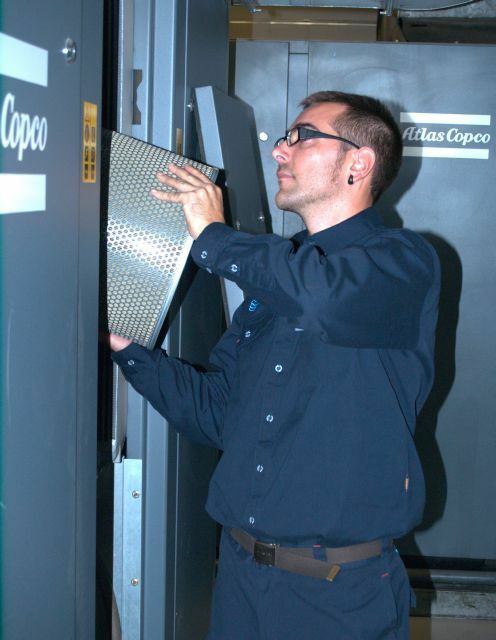 Our field service technicians are factory trained and authorized by Atlas Copco, Champion Pneumatics, MAKO, and Pneumatic Products Corp. Services are not limited to those companies we directly represent but extend to all brands of air compressors and air dryers. We supply parts and services for Ingersoll-Rand, Sullair, Quincy, Kaeser, and Gardner Denver equipment; just to name a few. We have gained a reputation in the field as absolute experts with desiccant air drying systems and we are certified to work on refrigerated air dryers as well. Based upon the customer requirements, we will use either OEM or aftermarket compressor and dryer parts for the services provided. Service and aftermarket support options include energy audits, as well as system performance evaluations. We are proud to be a qualified partner for Efficiency Maine and also work with several other PUC efficiency programs including PSNH, National Grid, and NYSERDA. Our two repair facilities (Lincoln, RI and Waterville, ME) are fully equipped with all of the necessary tooling and equipment to handle any job. Proper maintenance and repair of plant equipment is vital for uninterrupted operation. Pumps, pumping equipment, air compressors, blowers and cooling systems are used in all areas of the facility. Many plants have experienced staff and maintenance programs in place to reduce down time but if you need assistance D.L. Thurrott Air can help! We can help you develop a PM program that meets your particular requirements, or see below for further information on our Planned Maintenance program. If you just need some "help" at a busy time give us a call. We provide laser alignment with a printed report confirming final settings. We also offer blower repair services for Roots, MD, Gardner Denver and Kaeser from our team of factory trained technicians. We can remove, inspect, repair and re-install your equipment. Do you know when your equipment needs service? Don't let a catastrophic failure shut down your building... We can help you schedule your maintenance with our planned maintenance program! We offer 24 hour emergency service for those times when you do have a failure. For after hour emergency service, simply call the appropriate number, listed above, and follow the prompts for Service. One of our technicians will get back to you as soon as possible. If you don't have the space or necessary tools required for a repair you can ship your equipment to our facility or call and we will come get it. We will complete a full inspection and provide you with a written quote for the repair. Once we have your approval to proceed we will complete the repair and test the unit before it is returned.